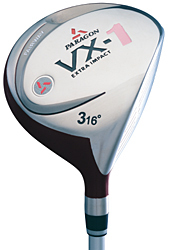 "Paragon VX-1 Fairway wood Features • Performance stainless steel construction for durability • Lower center of gravity and aerodynamic design to increase trajectory and distance • Fitted with Paragon's Pro X2 graphite shaft • All-weather control tour player rubber grip • Custom head cover included If you have any questions about this product or would like to order by phone, please call us Toll Free at 888-733-8383. We look forward to hearing from you!" ordered this club as a gift for my Grandson. Was advertised with head cover, from Paragon. Club was sent without head cover and when I emailed twice and got no response, I then called and was told they have no head covers for this club and the only solution would be for me to return the club for a refund. Needless to say I am not satisfied with this company and even though they offered the refund, I feel the ad was false. I can order a head cover for this club for around $14.00 from another company. By the way, the Paragon club is very satisfactory.